Lightning Motorcycles solar powered electric bike climbed to the top of the 14,115 foot Pikes Peak Hill climb just a fraction of a second over 10 minutes, clocking in at 10:00.694. Dunne's time outperformed the second place petrol powered bike by more than 20 seconds, marking the first time in history that an electric vehicle outperformed all combustion powered challengers during a major motorsports event. 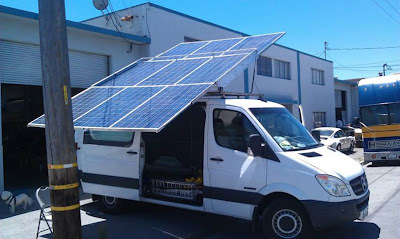 The Li-Ion battery on board the bike was charged during the event by a roof top mounted portable solar PV array mounted on the teams tow vehicle.